Once regarded as a mere footnote in a typical Shostakovich biography, Mieczysław Weinberg has deservedly risen out of the pack of unjustly neglected composers. At the 2010 Bregenz Festival, Weinberg’s Holocaust opera The Passenger was staged by festival music director David Pountney who gave high praise to Weinberg describing him as the “third man” alongside the two great compositional geniuses of the Soviet Union: Prokofiev and Shostakovich. A substantial momentum has gathered behind Weinberg’s cause underlined by the increasing number of recordings of his considerable output. Joining this flood of Weinberg interest is this welcome Warner Classics release of the Symphony No. 4 and Violin Concerto. Both works make a good fit having been composed only a couple of years apart and receiving their premières in 1961. This release inaugurates the new CD series by the Warsaw Philharmonic Orchestra produced by Warner Music Poland. Weinberg is sufficiently unknown to warrant a brief outline of his life. Born into a Polish/Jewish family in Warsaw he studied at the Warsaw Conservatory. Weinberg’s immediate family perished during the Nazi Holocaust in a Warsaw ghetto. Precariously, having to keep one step ahead of his oppressors, Weinberg constantly had to uproot. When the Germans invaded Poland in 1939 Weinberg fled eastwards until he escaped the advancing German army and arrived in what is now Uzbekistan finding work at the Tashkent opera house. Shostakovich had been sent some of Weinberg’s music for assessment and as a result of Shostakovich's encouragement he moved to Moscow in 1943. Exile was both a curse and a blessing. On the one hand, as a Polish Jew, it saved him from being murdered by the Germans; on the other it drove him into Stalin’s regime a terrorizing period of anti-Semitic discrimination including censure, blacklisting, his actual arrest and imprisonment, plus the murder of his father-in-law the actor Solomon Mikhoels by Stalin’s secret police. Over time Weinberg was successfully ‘rehabilitated’ within the doctrine of the Soviet political system. As Shostakovich was the pre-eminent composer of the time it is natural that Weinberg’s music is influenced by the great man. Weinberg's Jewish music culture, in turn, influenced Shostakovich. Composed in 1959 Weinberg’s Violin Concerto Op. 67 bears a dedication to Leonid Kogan, one of the pre-eminent Soviet violinists of the 20th century. It seems Kogan gave the première and recorded it on an EMI/Melodiya vinyl LP ASD2755. This also was coupled with the self-same Fourth Symphony and both recordings were later reissued on long-deleted Olympia OCD622. Weinberg’s friend Shostakovich thought extremely highly of the work, praise that is certainly justified as this concerto is a hidden jewel of the repertoire. Marked Allegro molto the hard-driven opening movement is seriously brooding and windswept with a recurring theme that embeds itself firmly in the consciousness. Noticeably Gringolts’ playing is incisive and determined. Imbued with Jewish folk music Weinberg paints a broad landscape in the Allegretto which gives it a squally outdoor feel. Then as if darkness has quickly arrived the writing develops an intense introspection with a gloomy, rather sinister undertow. Bleak and austere the Adagio is pervaded from beginning to end by a powerful sense of solitude and an anguished world-weariness. Coming as a welcome relief after the torment that has gone before there is a jubilant feel to the vibrant Finale, Allegro risoluto. In the orchestra the influence of Shostakovich is marked. Playing almost continuously I was struck by the direct approach from soloist Ilya Gringolts notably his wonderfully lyrical playing with attractive tone and spotless intonation. The orchestral support from the Warsaw Philharmonic Orchestra is responsive and well prepared with Kaspszyk never over-pushing the pace. Worth hearing is another excellent recent recording of the Violin Concerto played by soloist Linus Roth with the Deutsches Symphonie-Orchester Berlin under Mihkel Kütson from the Jesus Christus Church, Berlin on Challenge Classics and also reviewed here. At the time Weinberg was completing his Symphony No. 4 in A Minor in 1957 he already had three symphonies in the drawer unperformed. There was no good reason to expect anything different with this latest symphonic attempt. Nevertheless the Fourth Symphony was premièred in 1961 by the Moscow Philharmonic Orchestra under Kirill Kondrashin. For this first performance Weinberg had undertaken considerable revision to the score, swapped the central slow movements around and removed the titles of each movement: ‘Toccata’, ‘Intermezzo’, ‘Serenade’ and ‘Finale, Rondo’. Although erased it is interesting to reflect on how Weinberg originally visualised the work. The first movement a highly bustling ‘Toccata’, dark and bleak in character and containing a sense of alarm as if running to safety. With its plaintive solo clarinet opening, the bleakness remains in the following Allegretto with a feeling of cold desolation with a sense of the precarious. Despair is a theme in the third movement Adagio - Andantino which is wintry and barren. This merges with a haunted waltz tinged with a Jewish character. With propulsive and energetic dance rhythms the Finale: Vivace has a quasi-martial feel together with the now-familiar Jewish folk essence. The horn-calls with their repeated motif reminded me of the menacing horn motto at the start of the final movement Lento of the Symphony No. 21 ‘Kaddish’ on Toccata Classics. 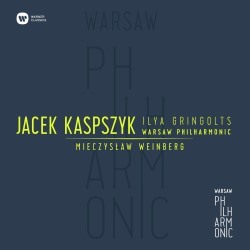 Recorded in 2013 at the Warsaw Philharmonic Concert Hall the Grammy Award-winning sound producers Andrzej Sasin and Aleksandra Nagórko are on fine form. Here is a recording with excellent clarity and balance and realistic presence. As for the booklet notes it is hard to ignore the poor choice of font and text colour which makes reading the information a trying exercise. Another bad idea is the ridiculously odd-sized CD slip case which is 13mm or so larger than normal thus making uniform storage difficult.